I am having a vodka sunrise....sitting in the shade on the little porch off our rooms with the Pres. He is doing his crossword, having a vodka cranberry as we wait for Jennifer and Angel to return from the store. A wonderful morning after a walk on the beach, a visit to the butterfly farm, meeting up with old friends from NH near the pool, we are now relaxing I the shade. Yep...did I tell you how sunny and breezy it is???? It looks gorgeous where you are! I had blackened fish tacos at Coconuts in Florida. They were yummy. Doesn't everything taste better by the ocean! So jealous I could just spit. That blue sky is calling my name. We definitely get the picture, JP, you are in a wonderful place with family and good friends and great weather...what's not to enjoy! 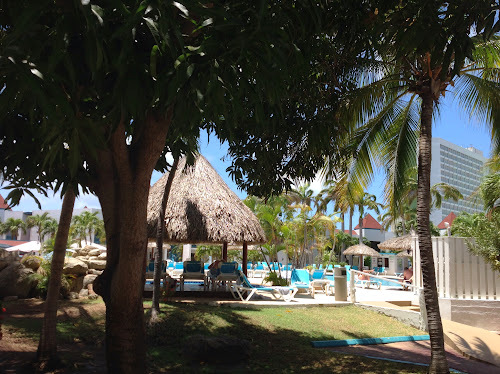 Oh no JP: Its tippling down with rain here..
Now I want to go to Aruba.. oh it looks divine. Enjoy it.. life is but short..make it sweet.